Ask any Mom on the street why she does the things she does for her family, and the answer will likely be simple - love. Our love for family, and desire to show it, drives just about everything we do as Moms. Whether baking cupcakes until midnight the night before your child's classroom party, dressing up like a princess to host a tea party with your kids or working overtime to be able to afford a special family vacation - sometimes we're willing to do just about anything for love. And with the holiday dedicated to love just around the corner, it might be time to look past heart-shaped chocolates and consider a different way of expressing your love...with the purchase of a life insurance policy. You might be asking yourself what love and life insurance in common. More than you might realize! Simply put, life insurance is a product you purchase because you love someone and want to make sure they'll always be protected financially, even after you're gone. As we know from the Valentine's Day celebrations taking place in classrooms and romantic restaurants everywhere, love and fun go hand-in-hand! To get Americans thinking about life insurance as an expression of enduring love, the nonprofit LIFE Foundation is sponsoring the Crazy4Love Photo Contest. From now until February 19, you'll be able to visit the popular microblogging website tumblr.com and share a photo that captures how you've expressed your love to someone dear to you. One Grand Prize winner will receive a $1,000 gift certificate toward a romantic getaway weekend. Go to www.insureyourlove.org to learn more about the contest and to enter. Check out this video from a very special "spokesperson" who knows a thing or two about love. 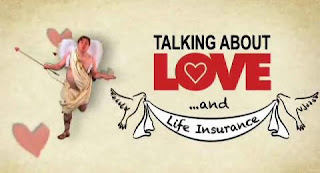 Join us to share crazy acts of love confessions, win fun Valentine-themed prizes, and learn about the peace of mind you gain when you buy life insurance and know that your loved ones will always be protected financially, even after you're gone. Think you have the perfect story of how you've expressed your love recently? Don't keep it to yourself! From now until February 19, you'll be able to enter the Crazy4Love Photo Contest by sharing a photo that captures how you've expressed your love to someone dear to you. One Grand Prize winner will receive a $1,000 gift certificate toward a romantic getaway weekend. Go to www.insureyourlove.org to learn more about the contest and enter today! Disclaimer: I was not compensated in any way for spreading the word about this contest and Twitter party, but by doing so I have been entered to win a $250 American Express gift card and a gift basket. Hopefully I won't miss this!! I have to watch LOST that night but will have to try to be there!